Zodiac is the first book in the Zodiac series, and it is absolutely OUT OF THIS WORLD (pun intended)! I've been hearing so much about this series, but I never had the chance to sit down and read all of the books. I'm so glad I finally took the time because I absolutely love the world that Russell has created. The world building involved in Zodiac was absolutely stunning. At first, the strange words and descriptions were a little overwhelming, but I was able to quickly visualize the world Russell envisioned. I loved the characters and the constant adventure and action. The main character Rho was ambitious and daring and I loved her fearless attitude. As always, I enjoy a bit of romance, and there was definitely a good bit of romance involved in Zodiac. I absolutely loved this novel and could not put it down. I can't wait to read the rest of the novels in the series in preparation for the release of the fourth book, Thirteen Rising on August 29th. Thank you so much to Penguin Teen and NetGalley for sending this novel in exchange for an honest review. I highly recommend this novel to readers who enjoy YA fantasy novels. 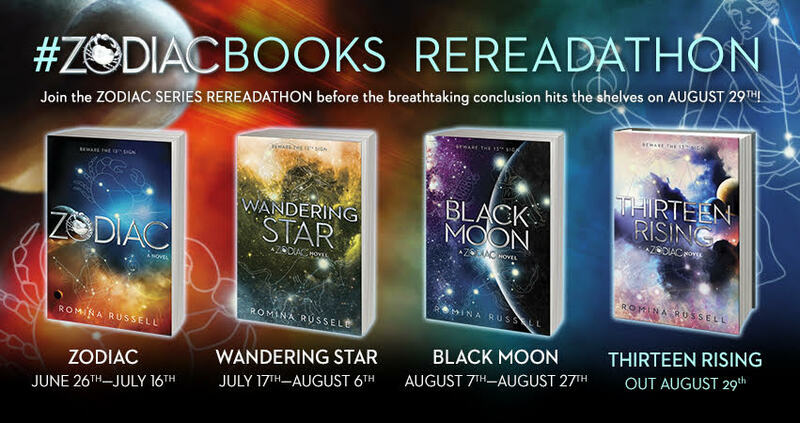 GIVEAWAY: Enter for a chance to win either one (1) grand prize set of Romina Russell’s Zodiac Series in paperback, including Zodiac, Wandering Star, and Black Moon (32.97) or to be one (1) of five (5) second place winners to receive a copy of Zodiac by Romina Russell (ARV: $10.99 each). 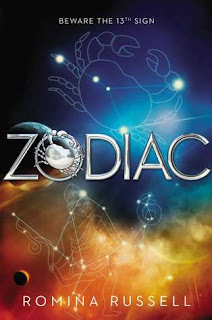 ZODIAC REREAD SCHEDULE: Check out these blogs for reviews, spotlights, mood boards and fun Zodiac themed activities! I enjoyed your review today. Thank you! I love that this author has created such a fantastic world that seemed real and made you suspend your beliefs and jump inside. I can't wait now to have an entire series to read. I'm excited for the series and excited that it has a space theme, something I didn't realize until this tour. Thanks for hosting!